The hunting season was closed today after a bird which was shot twice crashed bleeding into the yard of St Edward's College in Cottonera while the children were on their school break this afternoon. The decision was announced by the prime minister in a tweet. He said what took place today was inexcusable. "Despite sharp decline in illegalities, today's hunting incident is inexcusable. I have decided to immediately close down the season," Dr Muscat said. The season was due to close on Thursday. A teacher, Diana Triganza, who was on supervision at St Edward's, said the boys, aged between seven and 10 were 'traumatised' by what they had seen. Some of them started screaming when the bird fell into the football pitch. The incident happened at about 12.30. 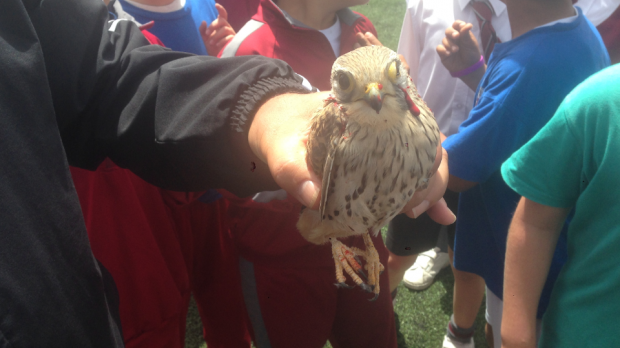 The bird, believed to be a Kestrel, was shot from outside the school grounds. It was first shot once and hit, and them shot again. Five shots in all were heard. The police were called and officers from the ALE took away the bird. Officials from the Animal Welfare Department told school teachers that the bird may survive. In a statement announcing the immediate closure of the spring hunting season, the government pointed out that immediately after the referendum, the prime minister had warned that he would not tolerate abuse. During the season, the number of abuses fell drastically thanks to strong law enforcement and the collaboration of those involved. Nonetheless, today's incident could not be justified. No information about who had carried it out had been received. Therefore the season was being closed immediately.This, the government said, should be a signal that such abuses would not be tolerated. One of the leaders of the referendum Yes campaign, Sylvana Zarb Darmanin, in a comment to this newspaper said: "Closing the season because of six illegalities out of 10,000 hunters in the field is ridiculous indeed! Will the PM be taking similar decisions for illegalities in other sectors of society? "Dear PM it is absolutely unfair to punish 9,994 law-abiding hunters with the wrong-doing of six poachers. You have the obligation and duty to safeguard their interests while ensuring that criminals are caught and punished. I am sure that you can never guarantee that your MPs will not commit illegalities. So how can you ever expect hunters to guarantee that there will be no poaching? You are stretching it too far Dr Muscat!!" The FKNK and Kaccaturi San Ubertu both condemned today's incident and called for whoever was responsible to be brought to justice. The Coalition Against Spring Hunting welcomed the prime minister's decision. "The coalition condemns in no uncertain terms the insistence of some on carrying out such atrocious acts, and commends the PM for not hesitating in following up on commitments to have zero tolerance for poaching, after a narrow majority voted to allow hunting of turtle dove and quail in spring. It reminds all bird lovers to remain ever vigilant to assist in the continued protection of Malta's avian friends visiting its shores. It shows that despite the occasional set backs, the people should persist in efforts to keep improving Malta's guardianship of its environment, which efforts can and do bear good fruit." The coalition also called upon the hunting community to spare no effort to put an end to heinous acts of poaching. The Nationalist Party said that closing the spring hunting season after today's incident was inevitable. Illegalities could not be allowed to continue and the governemnt was responsible to enforce the law. What took place today was not the only incident, and the government was therefore right to close the season, PN spokesman Charlo' Bonnici said. Alternattiva also welcomed the decision. It said there had been one illegality after another, and spring hunting did not make sense. BirdLife Malta welcomed the closure of the spring hunting season. Conservation Manager Nicholas Barbara said: “The closure follows a series of recorded incidentS involving illegal shooting of birds beginning with the shooting of a cuckoo on the second day of the season. Meanwhile, CABS reported today that two protected birds with shotgun injuries were handed over to the police by its volunteers yesterday. A team patrolling through the Mizieb woodland yesterday afternoon discovered a dead Cuckoo. The bird was hidden under a stone and was the fourth of its species found in the area since the opening of the spring hunting season. Officers from Administrative Law Enforcement seized the bird and took photos of the area where the corpse was found. The organisation also received an injured Yellow-legged gull which was discovered by a member of the public close to Pembroke yesterday morning. The bird was found to have injuries typical to shotgun damage on its left wing. The gull was passed on to the Government veterinary department. CABS said it had also informed the police about the locations of 63 illegal bird callers which have been installed by hunters in the countryside to lure birds to their hunting grounds. These electronic callers are predominantly used for Quail. The lures were found mainly in the north of Malta as well as on Gozo. The police informed CABS that “several” devices were found during night inspections and reassured them that they have since been dismantled accordingly. According to article eight of the European Birds Directive the use of bird callers is regarded as an illegal method employed for the mass killing of birds. Each unit is composed of a loudspeaker, a battery for power supply, a bird caller which imitates the courtship songs of the Quail and a timer which activates the pre-recorded bird calls in the night.